Radials? What are they then? Well, they're the bits that connect all of the Ringways together. It's no good having these big motorways going around London if you can only get to them by using narrow congested city streets. So, the Radials is a collective term for all the motorways heading into London, to allow traffic to get in and out, and hop between Ringways. Not all of these motorways were planned to go all the way in to Ringway 1, and some of them have their own features elsewhere on the site. Only some of them were built at all, and those that were don't finish in their intended location. All in all, it's a bit of a farce on the surface. It certainly seems like it. So why do the ones that were built all end so far out? Simply this: generally it's because there was simply nowhere to end them (though there is one exception to this!). If you were to build motorways all the way into London, yet not have the Ringways to disperse all of the traffic, you'd just end up with total traffic chaos. So, what we've ended up with is motorways that end at the best place possible. The M1 and M4 end on the North Circular, whilst the M20 ends on M25, and the M3, M23 and M40 end just inside the M25. All of those would have had extensions further into London, though it's not 100% clear whether they would all have been motorways. There's also the strange case of the A3 Esher Bypass, which looks for all the world like a rural motorway, even with a hard shoulder, but that doesn't appear in Ringways documentation; and the A2, which would definately have received an upgrade to motorway in the form of the A2(M) Dover Radial Route. You haven't mentioned the M11! So what happened there then? Simple really - the M11 survived in Government circles into the early 1980s, well after the days of urban motorway building were at an end. The corpse continued to twitch over the next 15 years, until the improvement to the A12 was constructed in the late 1990s. Indeed I did - there's one or two of those too! 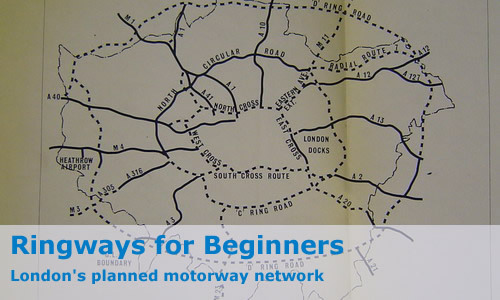 All in all, the Ringways and their associated roads were one of the biggest transport-related plans in the United Kingdom, and their research is the biggest amateur project ever undertaken into UK roads. Research is still ongoing, and the full archive for the project is held over on CBRD, in the Ringways History feature.